WHITE is a classic color that can look extravagant for any occasion. In Pakistani weddings, white color is used largely for Walima and Nikkah events. 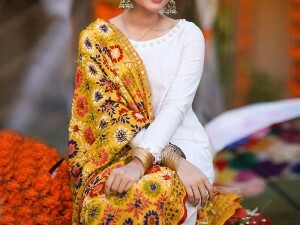 Since white is such a statement color that can be made as fancy as wanted, brides love carrying this color for their Nikkah to look like an angelic beauty. Whether it is a white, densely embellished gharara dress or a simple white gota work frock, you can wear it in multiple ways for your Nikkah function. You can also pair it with a vibrant color like red or pink, to create a pretty contrast. Nikkah brides in white look perfect with their grooms in matching white wedding shalwar suits. For Walima functions, large puffy white frocks are preferred to give more of a Christian bride look. 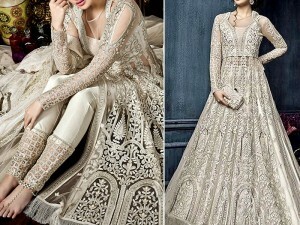 While others prefer giving a more eastern look to their white Walima dresses or white wedding dresses and often go with the white wedding lehenga, white wedding gharara or a long white maxi style design. 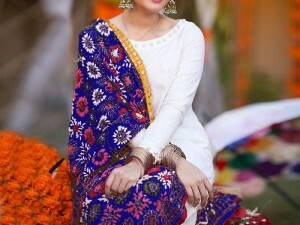 Again, plain white, heavily embroidered white dresses with pretty embellishments look gorgeous on their own, but if plain white is too bland for you, you can always get a dupatta or bottoms in a bright color to create a contrast. In many communities in Pakistan, a white wedding dresses for the wedding is a must. This is the reason that a lot of varieties of wedding wear is available in shades of white. Alongside brides, white is also a favored color by the wedding guests since it is attractive while still looking simplistic. If you are a relative of the bride and she is choosing a brighter hued dress, you can go with a white colored stylish saree or a white toned dress. This way you will not only look lovely, but will also be considerate as to not overshadow the bride on her big day. The white color is associated with purity and this is why it is worn by brides all around the world on their wedding days, regardless of their religion. Even in Muslim countries, the brides opt for the white color for their wedding dresses because of its simplicity and innocence factor. Since the color white is known as one of the favorite colors of the Prophet PBUH, it gives Muslims one more reason to love the color and to choose it for the wedding wear. Also, when everyone else will be styling themselves with dark-colored attires, you will stand out in the crowd on your big day.